The music of Iannis Xenakis is not normally associated with the salon chamber music genre brought to the fore by Joseph Haydn. Be that as it may, this composer of massed orchestral textures, dense electronics, polyrhythmic percussion music, this revolutionary iconoclast, composed four string quartets and a host of other pieces for chamber strings. This body of work represents one of the most important contributions to music for strings of the post-World War II era. This is doubly true if we also consider his accomplishments in the domain of orchestral music featuring strings, such as the massed glissandi of Metastaseis, or the stochastic textures of Pithoprakta. In fact, the vast majority of Xenakis’s instrumental output of over 100 works features strings prominently, whatever the formation. As the composer himself admitted, in the Conversations with B. A. Varga, “I have a particular flair for string instruments.” This “flair” went beyond that of a composer such as Béla Bartók, though, whose six string quartets, wonderful as they are, essentially treat the instruments in a traditional fashion. Xenakis went beyond the influence of Bartók (and others) to create a completely new sound for strings, to in effect turn them into new instruments. His music has also helped to give rise to a new breed of string players, and this recording is powerful evidence of that. This new sound for strings came initially from an analytical approach to sound and playing technique that arose from Xenakis’s unique background in engineering and architecture. In considering what string instruments were capable of, he was able to focus on inherent instrumental properties and performance possibilities rather than limit himself to the musical tradition, as others coming from a more conservatory-based training would have been more likely to do. So, the glissando, where a sound slides smoothly from one note to another by moving the finger along the string up or down the fingerboard, might be treated as a building block of the music rather than as an incidental or coloristic effect. The use of vibrato, a standard of traditional string playing, could be controlled or not used, in order to create a sharper, more focused sound. These two elements, non-vibrato and glissandi, became fundamental elements of the Xenakis string sound, as early as Metastaseis (1954) for orchestra (including 46 individual string parts), his first mature composition. After the milestone of Metastaseis, which, along with his second orchestral work Pithoprakta (1956), launched Xenakis’s reputation and career, it would be several years before the composer turned his attention to chamber music in general, and to the string quartet in particular. ST/4, his first contribution to the genre, was composed in 1962. The story of its genesis is complicated, as he didn’t in fact start out to write a quartet at all! In the years leading up to 1962, Xenakis had developed a formal model of music based on a set of basic axioms; the implementation of these rules would be achieved by the application of probability functions. This is what he called “stochastic music.” His aim was to create a computer algorithm that would generate music according to these axioms and using probability functions adapted to this purpose. He had worked out the basic principles of his formal model as early as 1955 (he first applied them to the composition of Achorripsis, completed in 1957), but he had yet to teach himself computer programming (recall that computer technology was in its infancy at that time). Having done that, he then had to find access to a computer—it’s likely that in 1962 IBM-France operated the only one in Paris. Xenakis arranged for access to the IBM facilities, and was able to run his algorithm a couple of times, and from these runs he initially generated four pieces: ST/48 for orchestra; Morsima-Amorsima for violin, cello, double bass, and piano; Amorsima-Morsima for mixed ensemble (subsequently withdrawn from his catalogue); and ST/10 for the same mixed ensemble as the withdrawn work. He also used his computer data to generated parts of Atrées for ensemble. In May of 1962, a concert was organized at the headquarters of IBM-France in Paris. Xenakis was the first composer in France to use a computer to create music, and his work attracted some attention. ST/10 was to be performed (by Konstantin Simonovitch and his Ensemble de Musique Contemporaine), and the idea arose to make a version of this piece for string quartet. The opportunity to compare two musical versions of the same algorithmic data would have been tantalizing for computer engineers and anyone else interested in the issues of computer-generated music. The quartet is in essence a transcription of the score for the larger ensemble. ST/10 includes a string quartet as part of its ensemble, so those parts were lifted directly. The next step of the transcription, though, was to add in anything else from the other parts of ST/10 that would be possible for the quartet to play. This includes percussion, where a drum roll would be transcribed as tapping fingers on the body of the string instrument, and harp, where the extended lower range could be played by the cello with judicious adjustment of the tuning peg of the lowest string. There is an audacity to the quartet transcription that lends an energy to the piece that is not as present in the original. The music of both versions proceeds by sections of varying lengths, each of the 15 governed by a different mean density (number of events per second). When the density is high (as in the opening section), the quartet sounds like it is really pushed to the limits of possibility. This creates a tension and sense of risk that is not present in the original work. Had Xenakis set up his algorithm to generate data for the quartet, he would likely have chosen a more conservative upper limit for the density settings (a comparison with the mixed quartet Morsima-Amorsima supports this point). The music is highly pointillistic, as the algorithm generates single events: a bowed note, a plucked note, a repeated note, a glissando. These events can be very short or very long. The sections of lower density highlight longer events, and, at times, silence. While the origins of ST/4 couldn’t be more formal and abstract, Xenakis succeeded in creating a visceral, compelling work for string quartet that challenges the idiom. Xenakis would challenge the idiom again, but it would be 21 years before the arrival of Tetras. In the meantime, he occupied himself with a whole series of chamber works for strings: solo works for cello, violin, bass, viola, a string trio, and works for strings with piano or other instruments. Over these years, a new generation of string players was coming of age, among them the Arditti String Quartet, devoted to performing the music of its time. With the presence of a quartet eager to perform his music as inspiration, Xenakis turned his attention to the string quartet idiom once again. Tetras (meaning “four”) was unveiled in 1983 to great acclaim. More than perhaps any other piece by this composer, Tetras balances structural thinking with idiomatic musical material in a way that is utterly original. The four players of the quartet are, for the most part, here treated as an integral unit, usually playing together as part of the same texture—four as one. There are exceptions to this, such as the lengthy violin solo that opens the piece, but these passages are truly exceptional. Most of the work is built from textures that involve all four instruments together exploring double-stop glissandi, layered ostinati, percussive noise sounds, and much more. At times, the sheer virtuosity of ensemble playing is absolutely breathtaking. At the same time, there are continual sparks of connection between the musical materials as the piece unfolds. The narrowing in of the glissando melody that opens the piece links to later trills, and these trills widen into rapidly oscillating slides. The rather rude grinding noises that are heard just over a minute in spawn a whole catalog of noisy sounds that take over the spotlight for an extended passage. The transition of grinding sound to ponticello at the end of that section opens up a continuum of timbral coloration that Xenakis explores in conjunction with register and dynamics. The glissando contours that are so prominent in this piece are at times reined in to become scale passages, and these ordered undulations might then scatter into pointillistic spatterings of notes all over the registers. In Tetras, Xenakis’s abstract thinking had evolved into a nonlinear, multi-dimensional web of formal and sonic relationships. There are clear divisions to be heard in the piece, but there is so much more to the music than a succession of contrasting sections. This is a piece you will want to listen to over and over, and truly is one of the defining works of the modern string quartet repertoire. By 1990, Xenakis was approaching 70 years of age, and the ill health that would plague him until his death in 2001 was already upon him. Nonetheless, this was a remarkably prolific period: between 1989-1991 he completed 14 works. Among these is Tetora, composed in 1990, again for the Arditti String Quartet. While the gap of seven years between Tetras and Tetora seems short compared to the gap between ST/4 and Tetras, we should note that in 1986 Xenakis had also composed Akea, for string quartet and piano. Clearly, the quartet was a genre he was becoming increasingly interested in! While Tetora also means “four” as does Tetras, it is a very different work. For one thing, there isn’t a single instance of glissando in the entire score, to that point a hallmark of the Xenakis string sound. The steely non-vibrato sonority is still fundamental to the sonorities of the piece, but gone is the exhilarating virtuosity of Tetras. Instead, Tetora is a more reflective score, one that particularly explores the continuum between timbre and pitch. Over several years, Xenakis had been drawing on ordered pitch collections that he called “sieves” (one might compare this concept to “mode” or “scale”). These sieves differ from traditional pitch collections in that the intervallic configurations that characterize them do not repeat at the octave (as the major scale does, or the dorian mode). As a result, melodic and harmonic elements derived from such a sieve produce different intervals (and different harmonic or melodic qualities, thereby) depending on register or transposition. 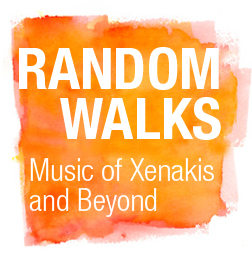 Xenakis draws us into this resonant soundworld right from the start, as the first violin intones a rather solemn melody, with each note of the phrase quietly sustained by the other instruments. The accompaniment gradually pulls apart from the melody, but the supporting harmonies are all drawn from the same pitch sieve. This unifies the texture while the unique intervallic characteristics of the sieve provide for variety and harmonic-timbral color. Xenakis does not stick to the same sieve throughout Tetora, but much of the piece is in fact based on the one heard at the beginning, including transpositions. Melody is given great prominence in Tetora, but the music resembles Schubert or Mozart not at all. The music sounds at once modern and ancient. The melodies are usually limited in register and are not shaped into expressive contours as one would find in Classical-Romantic music. The lack of vibrato also lends a non-traditional edge to the sonorities. Along with melodies, and their harmonizations, Xenakis makes great play in Tetora of register (often pitting high sonorities against low ones) and contrapuntal texture (solo passages, two parts, four parts, two against two, etc.). In addition, he gives prominence, later in the piece (notably at the end), to chordal textures that cycle rhythmically in unpredictable ways around a fixed set of harmonies. The result in such passages is a sense of stasis on the global scale with constant movement on the local scale. The rhythmic patterns in these passages are also limited but unpredictable. One is reminded of chaos theory (a scientific development Xenakis was very much aware of), where the controlling conditions are known, but the detailed unfolding of the system behavior is not. While Tetora eschews overt virtuosity, it is nonetheless extremely challenging to perform, particularly in the balance and intonation. If one comes to the piece without preconception of what a Xenakis piece should sound like, the music is beguiling and richly hued, again in a way that is utterly original. It only took four years for Xenakis to pen his next string quartet. Amazingly, as different as Tetora is from Tetras, Ergma is equally different from Tetora. Commissioned by the Mondriaan Quartet, this short work pays homage to the abstract geometries of the famous Dutch artist. The music of Ergma is very stripped down: harsh dissonance reigns throughout, chromaticism taking precedence over modal-sounding sieves; the musicians play full out at maximum loudness almost without respite; each instrument plays double stops invariably; the rhythmic flow proceeds by small multiples of the basic sixteenth-note unit, for the most part; the music stays centered in the middle register, there are no radical registral shifts. As with Tetora, Ergma contains no glissando, no pizzicato, no other extended techniques or sonorities. The overall sonority is thick and intense (for the most part, there are eight notes sounding at a time, played at fff), and the texture is often overlapping, where some instruments hold their double-stop while the others move to a new one. One might even think of this work as a “chorale,’ but if so, then it is one inspired by the choruses of ancient Greece, not those of J. S. Bach. As one listens in, the small differences in texture start to reveal themselves: a perfect 4th rather than the ubiquitous minor 9ths and major 7ths; a shift of rhythmic flow to double time; a passage that features the viola, the other instruments dropping to a quiet dynamic marking; fleeting passages of single notes rather than double-stops. Given how relentless the music otherwise is, these moments gain great significance. The experience is similar to viewing a Mondrian work, and eventually becoming aware of the asymmetries of the design and sensing the shift in balance that gives the work its energy. Many of Xenakis’s late works are monolithic and relentlessly austere, but within the framework of that style he was able to convey a maximum of expression through minute changes in texture or material. Ergma is one such work. Taken as a whole, the four string quartets of Iannis Xenakis present a remarkable overview of this composer’s development over a lifetime. In their own ways, each work is extremely challenging to perform, as each calls for new modes of playing, both individually and as an ensemble. This recording presents them all together for the first time, and I have no doubt that the listener will find these highly committed performances by the Jack Quartet truly remarkable, and equal to the extraordinary music penned by this remarkable composer. Xenakis’s own entanglements—his “X”—found a suitable mirror in the embedded dualities of percussion music. The foundational grammar of percussion music is inherently contradictory, based in part on the specificity of attack (tending to amplify modernist values of rhythmic complexity and intellectual precision), but it is also rooted in the deeply physical language of ritual (a signature of more ancient traditions). Following suit, the Xenakis percussion oeuvre itself seems to split into two parts. An early group of pieces—including Persephassa for six antiphonal percussionists, Psappha for percussion solo, and Dmaathen for single percussionist and oboe—are marked by vividly colored and strongly differentiated groups of instruments. Each of these pieces consists of a “multiple percussion” arrangement of drums, wooden and metallic instruments. Dynamic tension, and therefore the forward momentum of a composition, results from charged interactions between highly characterized groups of diverse sonorities. Think of the clashes between potent drums sounds and the pure high pinging of metal simantras mid- way through Persephassa, for example. (Simantras in Persephassa are resonant pieces of wood and metal, based on liturgical instruments found in Greek monasteries.) Later pieces utilize a more homogenous sound world, where tension results largely from a dynamic array of the forces within groups. In the early percussion works, clashes of sonority often produce a turbulent sonic surface where moments of frenetic activity are interrupted by sudden and shattering silences. Here musical processes incline strongly towards either end of a scale of densities. That is to say that this music almost always navigates between extremes of saturation or silence. As different as these two states may seem to be, they represent formal equivalencies in the early percussion music of Xenakis. Either can serve as a natural end state of active progressions in a piece. This equivalency is best demonstrated by two similar trajectories at the opening of Persephassa, his first great piece of percussion music, written for and premiered by Les Percussions de Strasbourg. Persephassa (the name refers to Persephone, the goddess of springtime) opens with a brief chaotic rise and fall of drum tremolos and follows quickly with all six percussionists performing interlocking rhythms to create a unified rhythmic field. As players break away one by one from the opening ensemble rhythm to play polyrhythmic variations, a sense of temporal dissonance grows and eventually culminates in a chaotic six-part rhythmic “cloud” (called nuage in the score). Here each player plays maximally dense and non-periodic rhythms to form a tempest of non-aligned notes. An almost identical trajectory follows immediately beginning again with slow unison playing. Then, again, independent temporal pathways break away until each of the six players is following his or her tempo. However, this time when maximum density is achieved, the texture is suddenly broken by a lengthy silence. In each instance a unison arrival at saturation or silence means that stability has been reached. However different the chaotic nuage may seem from the ominous silence, they have a critical quality in common: unity. Since all six players engage in shared behavior, the friction of “poly-structure” is absent. These behaviorally unified structures are therefore, in their essence, moments of repose. A later generation of pieces, starting with Pléïades (1978), the second of two sextets Xenakis wrote for Les Percussions de Strasbourg, features, as we have noted, far greater homogeneity of sound. Pléïades includes movements of a single color each: Peaux for drums alone, Métaux for “sixxen,” and Claviers for keyboard percussion instruments. Even Mélanges, a movement that mixes these colors, does so without provocation. The goal is peaceful coexistence among timbres rather than open warfare. Unlike the overt clashes between sonic groups in Persephassa, friction in Pléïades is to be found as the result of problematized rhythmic and textural interactions within a given sound world. Note, for example, that the sounds of the sixxen (“six” for the six members of the ensemble and “xen” for Xenakis), an instrument that Xenakis conceived and built with the help of instrument maker Robert Hébrard, blend easily to form a uniform field of color but are consistently distinguished in the composition by variations of rhythm and texture. The sixxen used in this recording were designed and constructed by red fish blue fish member Brett Reed according to the composer’s indications: each sixxen consists of 19 metal plates tuned micro-tonally relative to each other sixxen so that a unison passage produces a resonant, shimmering sound. Homogenous fields of instrumental color also mark Okho (1989), for a trio of djembes (West African hand drums) as well as Rebonds (1989) for a highly collated set of drums and wood blocks. The combative groups of instruments of Psappha and Persephassa are gone in these later works. Gone also are the sudden silences, but the polarity between unity and complexity is not. As in earlier pieces, moments of mobility are marked by “poly-structures,” that is to say by the presence of a multiplicity of pitch, rhythmic or textural events at any given moment. On the other hand, repose is the result not of peacefulness but of unity. Nodal points of formal articulation in these pieces function as they did earlier via commonality of purpose. You have reached stasis when everyone is (or in the case of the solo piece Rebonds, when all of one’s limbs are) engaged in the same task.